Donald Trump keeps in touch with all the television networks, but right now he has only one on speed dial: Fox News. In recent weeks, while declining virtually all other TV interview requests, Trump has appeared on Fox more than a dozen times. With Trump, it is impossible to know if the choices are temporary or something longer-lasting. But the focus on Fox, the favored network of conservatives, suggests that Trump is doubling down on his base instead of wooing independent or potentially undecided voters. On Thursday night after an attacker used a truck to kill dozens of people in Nice, France, Trump called into Fox not once, but twice — first for an interview on Greta Van Susteren's 7 p.m. show, then for a followup on Bill O'Reilly's 8 p.m. show. He was asked similar questions in each interview segment. O'Reilly's MSNBC rival Chris Hayes criticized Trump's call-ins, tweeting, "Trump doing a phoner on cable news with the bodies still in the street." Trump doing a phoner on cable news with the bodies still in the street. When Hillary Clinton decided to call in to Fox and CNN later in the evening, Hayes responded, "I think they both should've waited, but clearly this is the way this works now." As shown by Trump's sudden calls to Van Susteren and O'Reilly on Thursday night, new interviews could pop up anytime. But Trump hasn't appeared on MSNBC since mid May. He hasn't appeared on CNN since mid June. Meanwhile, Trump has been a near-daily presence on Fox News on weekdays, frequenting shows like "Fox & Friends" in the mornings and "Hannity" at 10 p.m.
On Tuesday he was interviewed by O'Reilly in New York. On Wednesday he was interviewed by 6 p.m. anchor Bret Baier in Indianapolis. By way of contrast, Trump's last Sunday morning TV interview was almost a month ago, on June 19, when he called into "Face the Nation" on CBS. He called into NBC's "Today" show two days later, on June 21. He taped an interview with Norah O'Donnell of "CBS This Morning" the same day, and he hasn't appeared on a network morning show since then. Trump's last interview on CNN was June 13 on "New Day." The regular appearances on Fox show how Trump and Fox News chairman Roger Ailes have set aside their differences now that Trump is the presumptive GOP nominee. 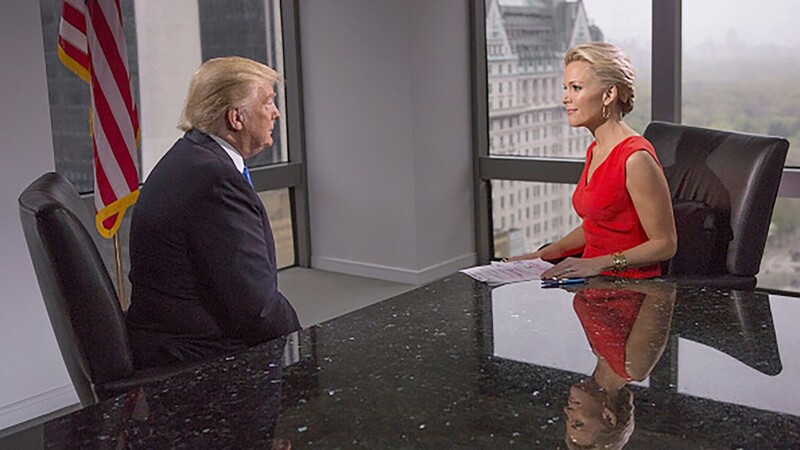 There was palpable tension between the network and the candidate last summer and fall, partly due to Trump's repeated attacks against 9 p.m. host Megyn Kelly. Even as hosts like Hannity and O'Reilly described Trump as a friend, Ailes blasted Trump for criticizing Kelly in the wake of the first GOP debate of the season, which Kelly co-moderated. Fox even seemed to freeze out Trump for a period of time — there were no interviews for two weeks in August and September. The Fox-Trump feud continued through the winter, with Trump pointedly skipping Fox's second debate, also co-moderated by Kelly. But Ailes and Trump remained in contact behind the scenes. In May, Trump and Kelly sat down for a highly anticipated interview that seemed to resolve some of the tensions that had existed. Trump has not been interviewed by Kelly since. But he has been interviewed by at least half a dozen other Fox hosts in recent weeks. Fox officials argue that many moderates and independents tune into the network's shows, not just ardent conservatives. But newscasts on broadcast networks like "Good Morning America" and "NBC Nightly News" reach bigger audiences than shows on Fox News. For now, Trump is largely shunning them and opting for Fox. Before the attack in Nice, the political press was fixated on Trump's vice presidential pick; CNN reported on Thursday evening that Indiana governor Mike Pence had accepted Trump's offer. The Trump campaign had already arranged for the running mate's first interview to be on Hannity's show Friday night. The campaign had also been talking with the CBS newsmagazine "60 Minutes" about taping a joint interview with Trump and his running mate. The interview would air on Sunday night on the eve of the Republican National Convention. But on Thursday night, speaking with O'Reilly, Trump said that "in light of what's happened tonight" in Nice, "I'm not so sure that I'm feeling good about doing '60 Minutes' and I'm not sure that '60 Minutes' is going to want to do anything other than this attack." In fact, "60 Minutes" normally runs repeats during the summer months, and doesn't react to the day-to-day news cycle. The potential Trump ticket interview on Sunday night would be a deviation from the norm. A CBS News spokeswoman said Thursday night that it had no Trump interview to announce.